Join Megan Batty, HCS-D, for a 60-minute webinar that will detail all the recent Coding Clinic guidance updates you must know to code correctly and compliantly. Coding Clinic is a source of official, binding coding guidance. Yet, it is not publicly available to the people who need it the most: home health coders like yourself. 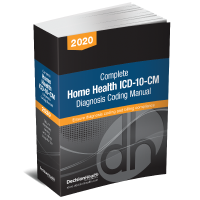 Many of the Coding Clinic updates published throughout 2017 have a major impact on common home health diagnoses, including respiratory conditions such as COPD and diabetes. Join Megan Batty, HCS-D, for this on-demand 60-minute webinar that will detail all the recent Coding Clinic guidance updates you must know to code correctly and compliantly. The Board of Medical Specialty Coding & Compliance has approved 1 continuing education unit for this webinar. (HCS-D). Ability to claim CEU’s for this webinar expires on 06/06/18. Megan Batty has worked for DecisionHealth since 2008 as a graduate fellow, editor, and junior product manager. She has covered multiple aspects of home healthcare for Home Health Line, OASIS-C & Outcomes Solutions, and Private Duty Insider, but has spent the majority of her time writing about home health diagnosis coding as the executive editor of Diagnosis Coding Pro for Home Health. She’s worked on many of DecisionHealth’s industry-leading coding products, including the Complete Home Health Coding Manual, the Coding & OASIS Field Guide, and the Home Health Coding Companion and Documentation Trainer; she also developed the new Wound Coding & OASIS Field Guide.